I found your blog by chance, while peeking others and I decided to check it out! I’m glad I did it, because I really like your fantastic corner. I’m your new follower and I’d be very pleased if you like my blog enough to follow it as well! I wish you lots of success and most of all a very Happy Birthday!!! Happy birhday annie!! :) you look gorgeous O_O please do a makeup tutorial for this greeny blue eye makeup look!!!! Happy Birthday Annie :) Keep on making good videos and enjoy ur gorgeous life! Happy Birthday Annie <3 I hope you have a magical day! Hauoli la hanau! 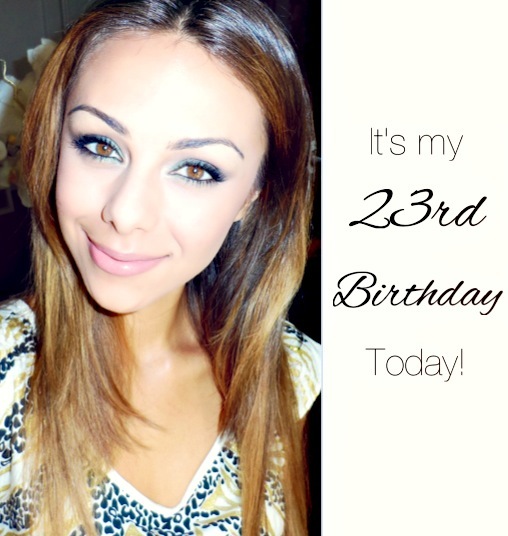 You make 23 look gorgeous! Joyeux anniversaire Annie!!! You have given us so much joy, hope and useful tips to make our lives more beautiful!! I can't thank you enough!! You truly are a blessing!! I wish you nothing but hapiness, (more) success and good health and love hi hi...you truly deserve it! Take care sweety we love u!!! Happy Birthday dear Annie! Wish you a very happy 23rd year on this earth! Looking forward to your next posts. They are so inspiring and you´re so lovely! I saw your blog everyday! You're a beautiful girl! Belated happy birthday Annie. May god bless you to achieve everything you want in life..
You look beautfil annie, could you do a tutorial on your birthday make up and your outfit. u look so pretty!!! Tutorial pleeeaaase!!! hi annie,Belated birthday wishes..hav a wonderful yr!!! ..u look very very very pretty! !